Δεκαετία! I am proud to say that on this day, 10 years ago, we have founded this great clan. It were Milos, Luka and I that decided to form B64 to match the competitive scene of SA-MP that was rapidly increasing since its release. Literally days later, we had many great players join, some of whom are ten years later still a part of the clan. We have had a great run during our 3 years in SA-MP, where B64 had the reputation of being one of the very best, if not the best clan in the game. Later, we would have tried ourselves in a set of different games, such as FlatOut and RFG most notably. Eventually, we ended up running two seasons of B64Club arcade games competitions based on Damdai's Supercade client, which greatly contributed to our community. Overall, I am very happy how the things went over the years and what B64 has managed to achieve. I would like to thank to each and every of the present and past members who have given their contribution to everything that we have done, and also to our friends and people who were a part of this community throughout the great times we had here. 10 years guys, great stuff. Couldn't have ever pictured this a decade ago. Have to love 2G. Want me to publish your article? Done it, just had to edit a couple of things. The extended article is on the front page. Amazing text bro. Reading it, I wish we stayed in Samp for another year. 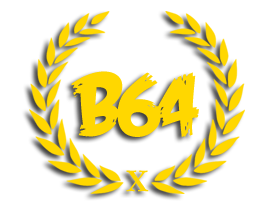 B64 have always been the golden standard ever since we founded the clan. It is not achieved by just having good players, but by establishing the right system with the right people. So proud to see this! I had amazing times with b64 in samp. When I just remember all those old days I wsh we could go back in time and do it all again.